It’s been one of those days today. After a late start due to overdoing the wine the night before while chatting via Skype to a pal overseas (and in a different time zone – hence the 3am finish) I wasn’t feeling particularly lucky. My Internet connection had been acting up for the last couple of days and I wasn’t expecting it to get any better. It got worse – not only did the connection continue to go downhill, one machine stopped working altogether. By the time I was finished testing cables – NOTHING would connect to the Internet and I could not even talk to the local router!! I went through each cable one by one (these go up through the loft etc.) and finally it got to the point where even a connection straight to the router would not work.. then out of the blue, everything started to come back to life. As I sit here at 11pm it’s as if there has never been anything wrong – all is working perfectly, I’m getting high speed Internet and I have not the FOGGIEST idea what that was all about! All’s well that ends well – tomorrow I’m off to Blackpool (again), the only saving grace to that is the possibility of a nice Indian meal! I’ve been doing some more studying on my pet hobby – Atmel processors and I reckon I’m about ready to go in at the deep end – accordingly I’ve ordered a cheap Chinese programmer so I can go deep into the chip registers and have a poke around – maybe I’ll have more luck with that than the Internet. We’re planning a trip to Spain – unfortunately I’m likely to be coming home from Turkey just at the very time we’re due out (October school break) so getting a flight from Turkey to Alicante could be fun! Much as I love to hang on to stuff, there comes a time during house clean-ups when things have to go… and so it is with this marvellous device that belonged to my dad (Donald Archer Scargill). 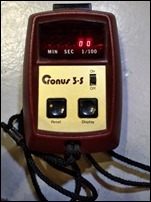 A keen hobbyist, he had a tendency to buy the latest and greatest gadgets of the time (like me) and the Cronus 3-S was supposedly the epitome of technology back in 1978. An accurate LED stopwatch, the unit uses 3 AA batteries to provide a bright display using (you may recall) those tiny LED displays with huge magnifying lenses of them, so beloved of Clive Sinclair. There’s an advert here for the original model, “Cronus 1” which you’ll see in the link is a lot more primitive. “The most accurate, rugged, compact and complete competition stopwatch in the world, period”. The fact is that even then it really wasn’t that big a deal, a crystal timer and a bunch of simple TTL logic driving a display but hey, making oversize claims worked for Clive Sinclair, why not for these guys. I did think of simply burying it – but hey – someone might find a use for it.. so.. The old remote control is starting to get a little out of hand and I’ve not even started yet. 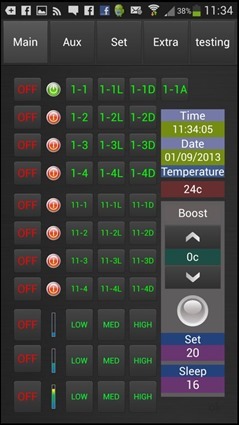 This test page controls 8 digital outputs and 3 fader controls for LED ARRAYS… offering various light-up commands now – as well as turning stuff on and off, I can control lights based on light-up and dawn settings! Once the technology is out of the way I’m going to have to think of ways to simplify this! Meanwhile Maureen is walking around looking bashed – the insects have got her again – they don’t half make a mess. I can see her being on anti-histamines to get the swelling down. Remote controls I left in Spain are working but the radio link isn’t perfect, seems to vary with temperature or more likely humidity as it’s the rocks that get in the way of the signal. (Update August 2014 – all sorted – controllers in Spain operating perfectly). Next job – throwing out old rubbish – we’re moving shortly (hence the rush to get the home control stuff ready for prime time) – so I’m going to have to be ruthless – if it’s not been used in 3 years – bin!